This week my class tackled the Notice and Note Signpost for Memory Moments. When a reader is tracking her comprehension and she comes across a situation where a character's thoughts are interrupted by a memory or flashback that comes to the character, they are having a Memory Moment. Memory Moments help readers understand the plot, theme, and relationship between the character and the plot. They give us insight into the character's motivation behind some of their thoughts, words and actions. When we encounter a Memory Moment in our books, I teach my students to stop and ask WHY might this memory be important? The answer will tell us about a conflict, or development that may be upcoming in the plot of the story. The conflict may involve just the character, or may be alluding to something that will be forthcoming in the story. I love when author's are really good at their craft... I mean, isn't that WHY we want to read their books? Gary Paulsen starts Hatchet right out the gate with a Memory Moment within the first 3 pages of text. Brian is sitting in the plane and he says "The thinking started." My fourth graders are currently reading Lunch Money by Andrew Clements. In chapters 5 and 6, Greg Kenton, the main character, shares two memory moments when he flashes back to the first time he meets his arch nemesis Maura. As readers, we learn about why there is a conflict between these two characters. I use these chapters in the book to talk to my students about internal and external conflict, and what that teaches use about a character as he/she is developing. In this particular book, Clements shows Greg remembering something that troubles him, his competition with Maura. This helps us to see the back story behind why Greg dislikes Maura so much. It also helps us to make inferences about the plot of the story. This really helps give my students a deeper purpose for reading. They look at the novel more closely, because they are reading to prove if their inference has foundation. 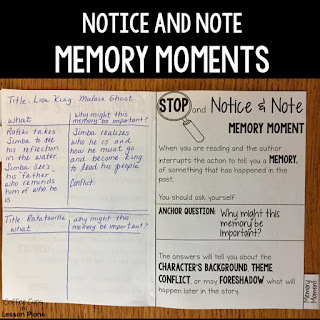 When I first introduce the Memory Momentnt Signpost, I show my students an anchor chart, and we use our tabbed Notice and Note booklets. We write examples of key words or clues we may encounter that will help us recognize the signpost. I also show them this video. It gives them another overview of the signpost. Then we use this video to practice the signpost with visual media. It is easy for them to recognize. If you have older students they will recognize this quick 20 second scene between Katniss and Peeta from the Hunger Games which gives great insight into the connection between the characters. Another book that I just recently found and am adding to my collection is The Day the Crayons Quit. I know this isn't a new book, I had just not thought about using it with Memory Moments until I pulled it out for our Mentor Sentences. 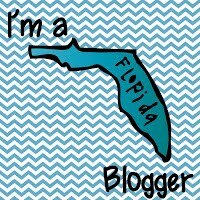 I LOVE when I have an AHA moment too! Do you have other books that you use to teach the Notice and Note Signpost for Memory Moment? 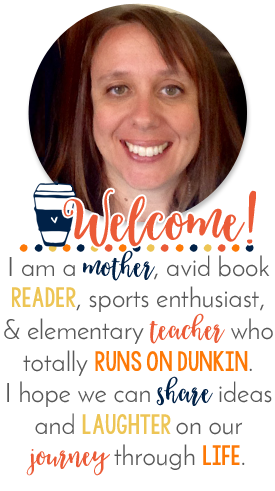 I would love to hear about any new books that you have found that help students!